The Komis, consistent in its history means not to leave the quality that connects intimately, more than 40 years, with consumers. 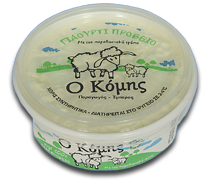 The sheep's yogurt "The Komis" is made from fresh sheep's milk in the traditional way. Without preservatives. It comes in full fat and low fat 1%.